Licensed College Jewelry!! Lead & Nickel Free Sterling Silver Plated Toggle Bracelet Suspends The Word "Huskers" On The University Of Nebraska Logo. 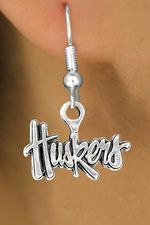 Scroll Down For More University Of Nebraska "Huskers" Items: W12820N, W12821E, W12822B, W12823N, W12824E, W13686SG, W13689SG, W13817N, W13818N, W14314KC, & W14315KC!